Manila, Philippines - Sen. Miriam Defensor Santiago on Thursday said that "there is a vast, costly, and sinister disinformation operation" to compel the Ombudsman to grant the motions for reconsideration of three senators whom she has found to be liable for plunder in the pork barrel scam. "The principals in this massive psywar operation are: Sen. Juan Ponce Enrile; his former chief of staff Gigi Reyes; and Enrile's ally and attack dog Panfilo Lacson," Santiago said in a commencement speech today at the Lyceum University-Laguna. Santiago earlier made the same accusation at separate phone-patch radio interviews with Radyo Bombo Iloilo, and with Radyo Inquirer. "Enrile, 90, is facing suspension from office as senator, and imprisonment in a detention cell while facing trial. He is desperate to prevent the Ombudsman from filing the case against him in court," Santiago said. She said that this "trinity of unholy conspirators" include Lacson and Reyes, because both were granted safe haven in Cagayan, his hometown, by Enrile. Lacson was a fugitive from justice who was never punished by the court when he finally appeared. "Where is Reyes? Nobody knows. Why would Lacson come forward with a spurious document, one month after he claims that it was handed to him?" Santiago said. Santiago, a multiawarded former RTC judge, said that Lacson's claims are "so full of holes that it's like a sieve." She said that it is "incredible" that while the Napoles family could have easily contacted other government officials close to Pres. Aquino, Lacson claims that only he was approached, although he is no longer a senator, and is working as one of many presidential assistants. The senator warned the public, particularly in Metro Manila, to "keep your composure and remain level-headed" during what she claims will turn out to be a "massive psywar disinformation campaign using pork barrel kickbacks." "This is a diversionary tactic, very similar to the so-called Zamboanga uprising. Both are bankrolled heavily, because they are intended to forcibly turn public attention away from the criminal culpability of those charged with plunder. For the respondents, this is a desperate make-or-break situation," she said. Santiago is a member of the Senate blue ribbon committee probing the pork barrel scam. Earlier, she wrote the committee chair Sen. Teofisto Guingona III to recall Janet Napoles to the witness stand. 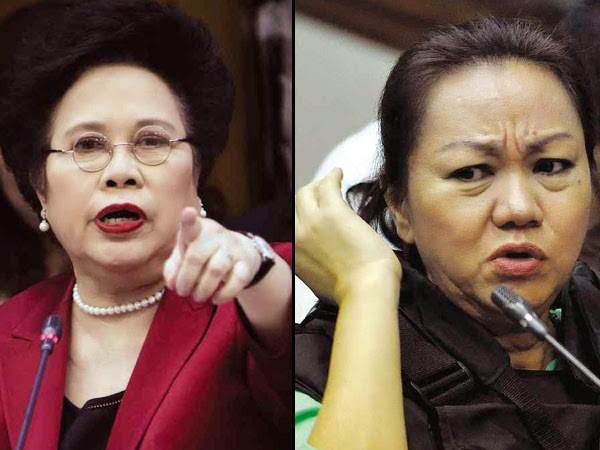 Santiago called for a new hearing, on the basis of Justice Secretary Leila de Lima's report that Napoles promised to give a complete list of all culpable public officials that she dealt with. Since 2000, Napoles started creating NGOs which became implementing agencies or conduits for ghost projects funded by pork barrel. Santiago also called for "enlightened skepticism" in accepting Napoles' new version of events. The senator expressed disquiet that Napoles is now claiming that she had transactions with many other public officials, none of whom were named by the whistleblowers who testified at the Senate hearing. "Napoles could be damaged goods. How come that her former employees have documented dealings with named public officials, but they never mentioned other public officials whom Napoles is now scheduled to reveal?" Santiago said. "Sec. De Lima is entitled to the legal presumption of regularity in the performance of official functions. Lacson has no legal basis for whatever he thinks he is doing. Remember, he is not even a lawyer, but a policeman with a very shadowy background, including his martial law record of human rights abuses, unsolved police rubouts, and the Atimonan massacre committed by his PNP cohorts," she said.